At Superior Healthcare, we are able to offer family chiropractic care to residents in Metairie, Louisiana. With our services, we can help you with back and neck pain. Though our services are reserved for anyone in your family, there is one family member that is more at risk for serious back injuries — mothers! Mothers are by far the most at risk for back and neck pain. Why? For one, mothers will typically carry their small children for long periods of time, lift heavy bags, and tote weights that can cause back pain. 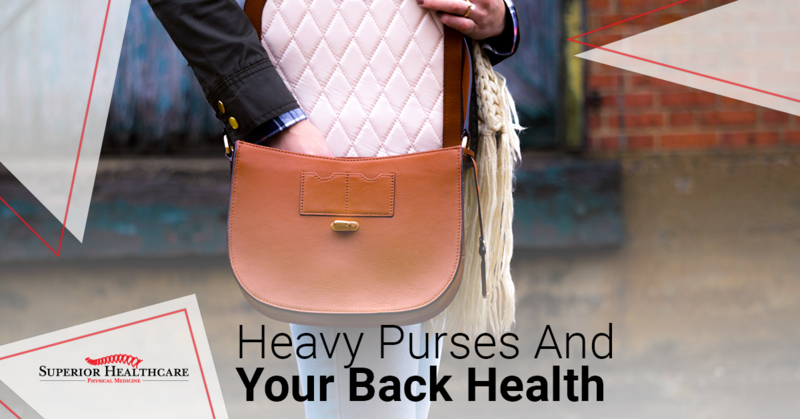 Though these are all primary reasons for back pain, one of the real reasons why women have back pain is the size and weight of their purses. Despite what you may think, the common-day purse can actually shift muscles and cause extreme back, neck, and shoulder pain over time. In this blog, we will be discussing this phenomenon, as well as how to improve your posture after years of shoulder strain. Hopefully, by reading this blog, you will understand the toll that heavy purses pose on your health and find ways to limit the amount of weight you are carrying. How many times do you recall loading up your purse for work, school, or vacation? All that weight you piled onto your shoulders could have taken a toll on your health. How? Well, think about it, your shoulders weren’t meant to take on such a heavy load. And, you also have to consider how often you are picking up and toting your heavy bag around. Even just an hour of carrying a heavy bag, every day, could cause shoulder damage. When you carry a heavy purse, you are typically favoring a certain shoulder to holster it, causing your posture to be off-kilter and your spine to bend in ways it wasn’t supposed to. When this happens, your body is subjected to strain, which causes pain and eventually you will need physical therapy or pain treatment. To bypass the “painful part” of this scenario, you must limit the amount of weight in your purse and learn how to properly carry your bag. It can be impossible to tell someone to stop carrying anything at all. But managing the weight and how you carry it, can help significantly. By taking small steps to maintain good posture, you won’t be as at risk for serious shoulder or back pain due to your purse. And, by taking better care of your shoulders and back, you will have less reason to seek out treatment from chiropractors. Support is key when it comes to your purse. Most conventional purses are carried with one shoulder and the weight is shifted behind your back. This can obviously be problematic, as your shoulder and posture are sacrificed in order to support the weight you are carrying. Part of the problem with purses is that they favor one side of your body. Because one shoulder is bracing the weight of your bag, it can make your muscles seize up or spasm. In order to keep your shoulder muscles unharmed, you may want to limit what you carry and how you carry it. This means that you should opt for a bag that offers more support. Cloth bags often don’t offer much support and can actually cut into your shoulder and disrupt your shoulder muscles. If you must choose a single shoulder bag, choose a bag with thick, wide straps is better for you. For instance, leather bags with wide straps more than two inches are better for your shoulders. It is important to stay away from bags with chain handles. Metal chain purses can be terrible for your shoulders and dig into your muscles. Not only that, but depending on the weight of your bag, you could cause indents in your shoulder from the metal straps. Backpack purses have come back with a vengeance — and with good reason! These adorable purses not only come in a wide variety of sizes, but they offer better support for your back and shoulders. Part of the problem with tradition purses is that all the weight is shifted to just one shoulder, and only use only one strap to carry all of the weight. Two straps are better than one because the weight is evenly distributed to both shoulders. This way, your shoulders can work together to carry the load. It is best if you have to carry a large range of items, that your purse is a backpack bag. Though backpacks may not be your favorite fashionable choice, it will help you and your back live pain-free for many years. Today, backpack bags come in a large variety of styles and sizes, which means you have a lot more options to find a backpack that suits you. For instance, backpacks can now comes in stylish materials, such as animal leather, velvet, and patent leather. If you are choosing to carry a backpack, however, the amount of weight you are carrying is important to monitor. Though backpacks have many benefits, in terms of comfort and back health, they can also be problematic if too heavy. If you backpack has too much weight in it, than the problem can be exponentially worse. For instance, instead of one shoulder bracing too much weight, both of your shoulders can be affected. According to the University of Iowa Hospitals & Clinics, the amount of weight you carry should be directly related to how much you weigh. For example, if you weigh 150 pounds, you should only be carrying 15 pounds on your back. Of course, even 15 is a lot! To be easier on your back, try to carry less in your bag at all times. We don’t mean the weight on your body, but the weight in your bag! Purses can get unnecessarily heavy faster than you might think. Items, such as your wallet and makeup can increase the weight of your bag incredibly and cause shoulder pain. One of the best ways to limit the amount of weight you are carrying is by organizing your bag to carry a minimum number of items. Or, if you feel that some of the items are essential, designate one bag for one thing, such as snacks and other kids items, and the other bag for your personal items. This way, you can still have all the items for your kids and yourself, without piling all the items in one bag on your shoulder. This is particularly useful for moms that feel like they require a suitcase to get from point A to point B. By separating your items, you can prioritize what needs to be carried and when. For instance, kids items aren’t always necessary to bring around with you. Instead of placing them in your bag, but them in their own sack and leave them in the car. Another way you can limit the weight on your shoulders is by going through your wallet. You may not notice, but coins and excess cards can add a lot of extra weight to your bag. If you are carrying a lot of extra change in your bag, you could be causing damage to your shoulders unknowingly. To help lighten your bag, empty out your coin purse and put it in a bag. With all this extra change, you can take it to a coin exchange machine and get cash for the coins that you are not using. This way, you not only limit the weight in your bag, but you get cash for your efforts as well! For cards, it is important to go through your wallet and determine what is important to carry around. For instance, your credit and debit cards are important; random business cards, coupons, and everything else is not that important to carry around. Do not wait for the painful symptoms! One of the worst things you could do for your back is to wait until the weight becomes a problem. But, if you are suffering right now, contacting your local chiropractor is a good idea. At Superior Healthcare, we have chiropractors available to help soothe and rehabilitate your neck, shoulders, and back. Don’t wait until you feel pain, find better solutions to carry your belongings. Call Superior Healthcare today!